Went to the West Hollywood Book Fair on Sunday to hear the young writers of WriteGirl read their work. WriteGirl is a mentoring organization bringing together writers and at-risk high school girls through writing. It’s an all-female enterprise, guys. Their work is published annually in an anthology. 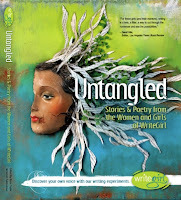 This year’s award-winning publication is Untangled. In addition to the stories and poetry, the book includes writing prompts and exercises which teachers and writing groups have found helpful. Keren Taylor, the founder of WriteGirl, asked me to read fro m the book, which I wasn’t expecting. This was good since I didn’t have time to get nervous. The girls meet with their mentors on a weekly basis outside of school, and participate in a monthly workshop emphasizing journalism, song writing, flash fiction, novels, short stories, creative nonfiction, or poetry. At some point, I’m sure we’ll offer a workshop on blogging, which brings me to my next topic. Caught the tail-end of Dan Olivas’s panel To Blog or Not to Blog. Amongst the blog-fulfilled were panelists Adrienne Crew , Margo Candela , Kevin Roderick and Mark Sarvas , who blog on a variety of topics including the literary scene, blogging, and L.A. Regarding the question, To B or not to B, their blogs are still active, so I think it’s safe to say their advice was to Do it, baby! Take a look at their work to see what has worked for them. 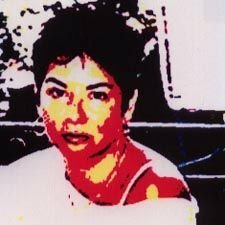 In particular, click on over to La Bloga, a cooperative of six bloggers (and the occasional guest). 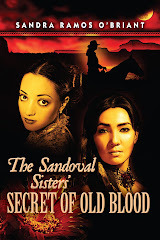 You'll see Dan Olivas's name in the masthead, and at the Elegant Variation, he's the guest blogger interviewing Lisa See, author of Peony in Love (Random House), Snow Flower and the Secret Fan. Ooh you would make a great WriteGirl mentor! I mentored with them a few their second and third years and it was a terrific experience. For most of these girls, the writing is a way of finding a place (a voice) in their world, a place to go. It's more than Dear Diary (bet you did that, cooper),but I don't want to minimize the importance of those adolescent yearnings, burnings, and complaints. Blogging is another form of it. What they learn, I hope, is how to use the written word. They don't get enough opportunity to do that in their worlds. If they stay with the program, they graduate from high school, and go on to college.